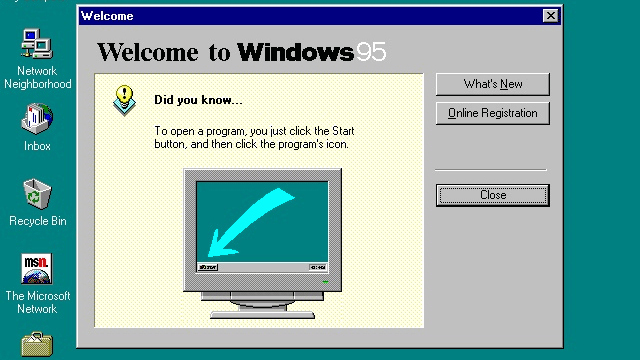 20 years ago today, Windows 95 was officially released. The now-obsolete operating system helped pave the way for more users to be more acquainted with computers in an era when concepts like Wi-Fi, 4G, and superphones seemed more fictional than real. "Start Me Up" functioned as Windows 95's theme song during its massive launch, and you can now DL a copy of it via the Windows Store until midnight at zero cost. As for us, we'd like to celebrate this event by looking back at the times we thought it was the coolest thing ever. Read on for Windows 95 memories '90s geek can relate to! This classic tune acted as a melodic signal that we're about to embark on a journey dominated by pixelated icons and old school graphics with the help of the then-almost futuristic thing called the computer mouse. Hear and shiver. Sure, it will remind you of EDSA traffic during rush hour, but dial-up Internet had its memorable moments, like the weird sound it made when connecting to the web. A lot of '90s geeks first heard this on their Windows 95 desktop, a nostalgic tidbit we're sure they'll remember even when they're old and gray. Seen The New NBA 2K16 Trailer Yet?